If there's a fellow who knows a thing or two about hard sounds, it's Scot Project. Born Frank Zenker, he's been in the business of delivering hard trance for almost two decades now with no signs of slowing down just yet. He has been an influential figure on the scene with his long strong of club hits, all following the unique titling method of using the first letter, followed by the name of the sample he uses in the song, such as "L (Want Your Love)", "R (Rock!)" and "O (Overdrive)". 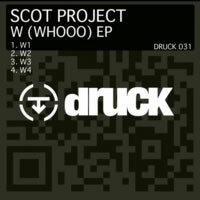 In 2012, Scot Project put out the "W (Whooo) EP", a collection of four tracks that dare not only to make you dance but also to cause your foundation to quiver a bit. First up is W1; we are presuming that all four songs are "Whooo"-based. And it's true: all four songs feature a high-pitched voice that shouts "Whooo!". W1 starts off with a bit of a junglish beat, then introducing us to the dark and absolutely pounding bass that we'll come to hear many times in this package. A varied bass-laden buildup slowly leads us into a more calming trance melody, although that one lovely wicked and explosive bass never quite escapes us, always popping in at the right time. A strong synth leads the way into that melody, but it surely doesn't stick around for a long time, instead bringing more pounding bass and a beeping synth to lead us back home. It's a good floorfiller and a neat way to start out the EP. W2 is a bit more subdued, using muffled reverbed piano and sensual female moans to lure our ears in. That jaunting bass isn't far behind, either, and it soon fills our speakers to the max alongside a piano riff. There's never a distinct melody found here, but the bassline and piano are eventually accompanied by the same sharp beeping synth as in W1. It won't be the last time we hear it. W2 is arguably the weakest of the four when it comes to a hard trance set, but the unforgiving bassline still makes this a worthy listen. W3 is where the power truly lies. If I wasn't bragging enough about the gruff bass before, this track practically throws it right in our faces. After a funky house buildup and some more of that beeping madness, it hits you like a brick: the pounding of the deep bass, pouncing like an audio lion! That bass holds up the first half of the song. Suddenly, the breakdown aligns us with a new and powerful melody, simple yet trancelike, eventually filling with energy and ready to explode on us at a moment's notice. W3 is ready to make all hands wave in the air immediately! And W4 aims to do the same, focusing more on another uplifting and catchy trance melody, demonstrated with a very rich and padded sound. In between, we also get a stylish beep-synth interlude that itself is rather funky. The only thing absent in W4 is that overpowering bass, but there's more than enough to keep your ears entertained in the meanwhile. The four tracks seem to have a connection in some ways, using similar elements and sequences in all. Scot Project likely had a clear vision in mind when stringing these four songs together, and they complement each other quite nicely. The W (Whooo) EP is topnotch for the club DJ that definitely wants to raise the roof. Kudos to Scot Project for keeping my arms in the air for quite some time with this one.